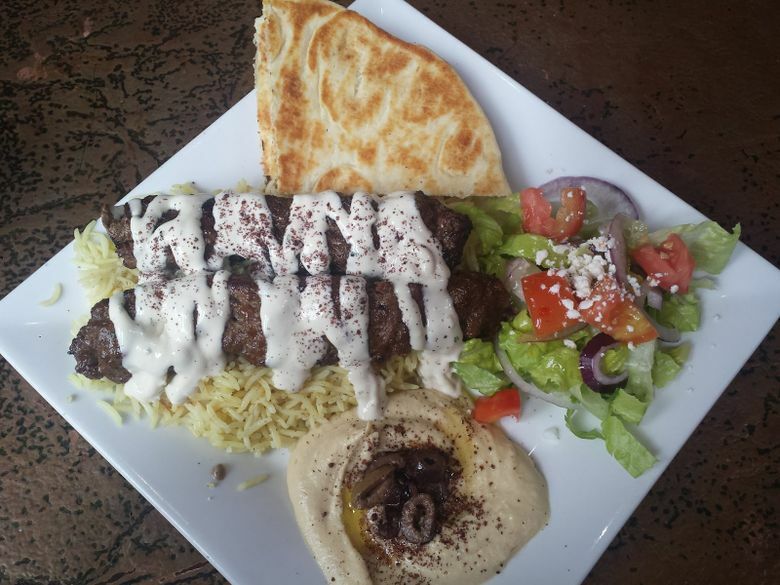 Get your fix with a wide variety of Middle Eastern dishes, from kebabs to baklava. Ibrahim opened the no-frills spot in early May with Hazim Hrahesh, an old friend from Jordan whom Ibrahim reconnected with in Seattle via Instagram. “Sometimes destiny brings people together,” Ibrahim says. During the day, CNN plays on a massive television, entertaining guests while they wolf down gyros and fries at one of a handful of copper-topped tables. The atmosphere is casual; you order from the counter and grab your own drinks out of coolers near the front. There is also a small grouping of tall stools against a narrow bar streetside. The menu: A wide variety of Middle Eastern dishes, including kofta, kebab, gyros and shawarma alongside house-made hummus, baba ghanouj and sweet or savory pastries. Ibrahim’s wife, Huda Khadair, makes all the sweet pastries, including baklava and hareesah (semolina-based cake flavored with rosewater and almonds), while Ibrahim’s specialty is fatayer, a soft, flat pie stuffed with ground meat, cheese or spinach. He says he hopes to expand Al Basha’s hours further to include breakfast and expand Khadair’s pastry offerings sometime in early 2018. Don’t miss: The menu allows you to order any large item (such as a kebab or gyro) as a sandwich, plate or salad. The chicken-kebab sandwich features tender hunks of marinated chicken breast, grilled and accompanied by an incredibly flavorful garlic sauce, a schmear of tahini and a sprinkle of tomatoes in a pressed wrap, which effectively seals in all the juices. The lamb kofta is ground lamb mixed with onion, parsley and spices, formed around a long skewer and grilled. Although perhaps not the most beautiful item on the menu, when eaten as a plate accompanied by rice, a generous dollop of hummus, soft pita and a small vinaigrette-tinged salad, a bite of kofta topped with hummus and piled atop a shred of pita proves to be a delight. What to skip: The fatayer is Ibrahim’s specialty, and while the dough is wonderfully soft and tender, the spinach filling proved to be a bit too sour. Try the cheese or zaatar filling instead. Prices: A chicken-kebab sandwich ($7.99), a lamb kofta plate ($12.99) and a spinach fatayer ($5.49) totaled $26.47, more than enough for two.